Originally be the administrative capital of South Africa, Pretoria still carries the name "purple flamboyant flower city" with thousands of flamboyant trees were planted around the corner, roads, parks or gardens. Situated in the humid subtropical climate area, the spring time in Pretoria began in September and lasted until May 11th. Because of that, from the middle until late spring is the time period when purple flamboyant start blooming. Purple flamboyant trees in the capital Pretoria had been brought to South Africa by chance since the 19th century. Despite this flower was originating from South America, this species still thrive in hot and humid climate of South Africa and drought tolerance pretty good. 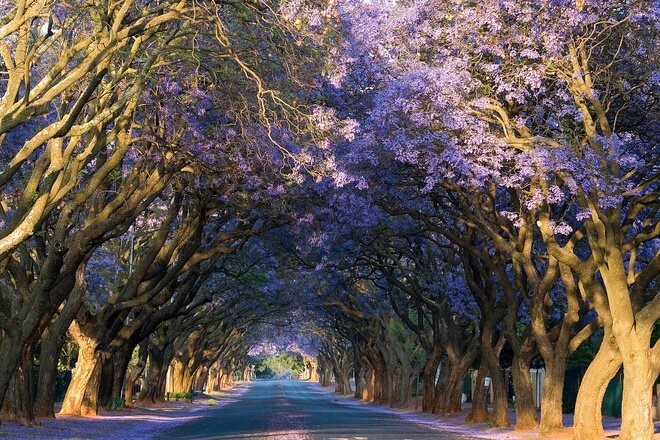 According to HubPages, two purple flamboyant tree was planted first in the playground of a school located in the Arcadia area of Pretoria in about 1888. Since then, the number of this species begin to multiply extensively and people in the city was strongly love this flower and they even plant them in many kind of pot. However, as it is a strange kind and come from outside the country, means that it is something not represent the image of the country, purple flamboyant can only be grown under the strict supervision of the South African government because the plant may cause loss of local ecological balance. As a rule, authorities are allowed to retain Pretoria all number of purple flamboyant in the city, but the trees which have died will be replaced with a new tree species. The government must make a concession like that because if they cut down the entire city of purple flamboyant, Pretoria would lose an inherent characteristic – which is totally not good, they will lose a lot of profit from visitors as a consequence. The purple flamboyant flowers grow very well in many areas, such as Central America, South America, Cuba, Jamaica and some Asian countries, however, purple flamboyant tree is still listed as "vulnerable" in the Red List of the Union nature Reserve IUCN. Not only the excellent tree for Pretoria Car flamboyant purple, white flamboyant also dotted a few corners on the picture of the capital of this nature.